The Avaya 1416 phone is the top model in the Avaya budget 1400 handset series. It’s great value and is suitable for receptionists and managers alike. It’s stylish, easy to use, feature rich comes in a format that customers are used to. For 90% of customers they would be hard pressed to require anything more. Read more about the Avaya 1416 phone below. Perfect for receptionists, assistants and managers, the new Avaya 1416 phone handset is the flagship model in the more budget orientated Avaya 1400 series. 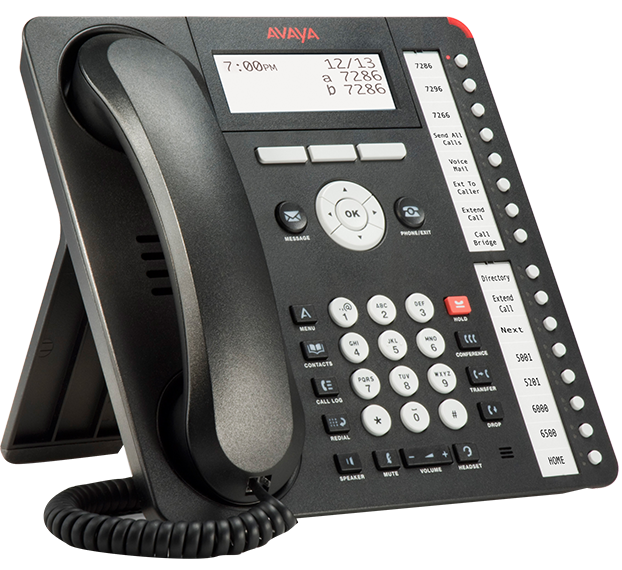 This new 1400 series offers a more traditional looking pbx handset. The Avaya 1416 phone has 16 buttons down the right side of the console that can be programmed for staff, phone lines and other things and uses paper labels. The premium Avaya 9508 phone, the closest comparison in the Avaya 9500 premium series, offers the same overall features and functionality but operates quite differently. Tthe Avaya 9508 offers a large display and everything is displayed there with buttons on each side of the screen - you can toggle between 3 different screens to see the equivalent of 24 buttons overall. This is the largest difference between the Avaya 1416 phone and the 9500 premium handsets as they offer large screen with digital labels and it is a very different user experience. For most customers it really comes down to what they are used to and what they prefer. If you're used to traditional key stations then the operation of the Avaya 1416 phone will be a very simple transition. The Avaya 1416 phone is perfect for people who spend a lot of time on the phone. Unlike the Avaya 5420 phone it superseded, the 1416 now looks like a traditional style phone and has quickly become incredibly popular with Avayy IP Office 500 V2 phone system customers. The Avaya1416 phone offers a slightly bigger (and adjustable angle) screen and 8 more flex keys than the cheaper Avaya 1408 phone. The handset looks great in black and it can also have the optional Avaya 32 button DSS console added to it to give a massive 48 keys in total for easy viewing and one touch transfers at reception. In a typical company you'd buy the Avaya 1416 phone for a receptionist and managers while the rest of the staff would get a mixture of 1408 and 1403 handsets (for basic requirements). One of the best additions to the new Avaya 1416 phone (and the whole range for that matter) is the green and red LED lights next to the programmable flex keys. With a simple glance you can now see if a staff member is available or on the phone. If you're looking to implement the awesome One-X on screen platform where you can do everything with the click of a mouse then you don't necessarily need the Avaya 1416 phone. The 1408 does everything most staff could want and is perfect for both small and large companies alike. The only real need for the Avaya 1416 is if you had a more staff and literally wanted to see more people on your handset at a glance. If you have more than 16 staff and want to do this then you'd opt for the cheaper 1408 and simply use the One-X platform anyway. The Avaya One-X allows you to do everything you need on screen from listening to voicemail, to answering and even transferring calls, accessing personal and company speed dials and even co-ordinating a conference call. If you're looking for budget IP handsets to compliment the Avaya IP500 V2 phone system then check out the 1603, 1608 and the equivalent looking 1616 handset. Otherwise there's always the very cool, and incredibly feature rich premium Avaya 9600 IP series to consider if your budget permits.